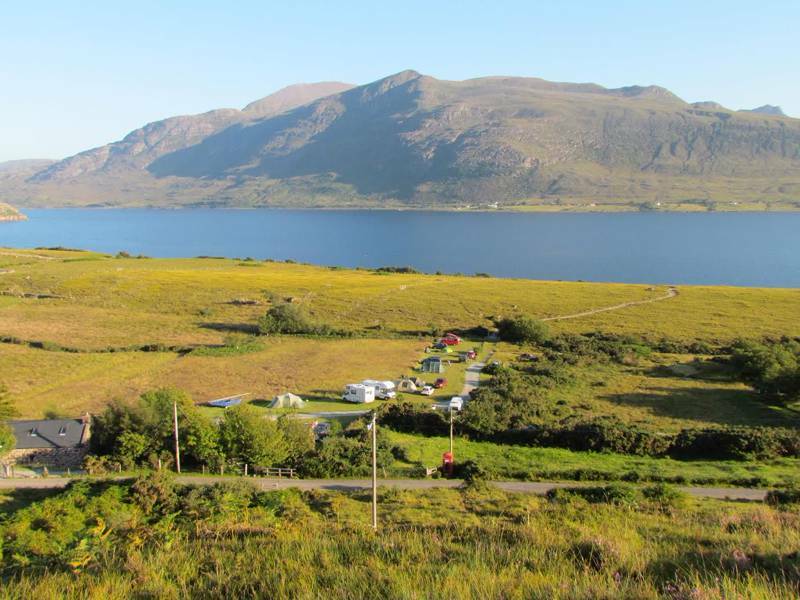 Take your pick of available grass pitches at our lovely lochside campsite – Little Loch Broom is just beyond a small hillock. We do not assign particular pitch numbers for bookings made online, so when you arrive please take an available pitch. Some of our pitches have fire pits - availability of fire pits is on a first-come, first-served basis. If you are booking for several tents, please book a pitch per unit, but feel free to pitch together when you arrive! If you require a pitch with an electric hookup, please select one of our four pitches with electric hookup, if available. We are a remote Highland campsite, complete with holiday cottage and a simple bunkhouse that comfortably sleeps 12. If the weather or midges are terrible then the bunkhouse (we call it the bothy) is there to help you escape – often this is best with a dram on front of our wood-burning stove. We have toilet and shower facilities better than many larger campsites and different types of pitches for different tastes – either hide in the gorse or stay out in the open. We've even got four electric hook-ups! You'll find some of the most stunning scenery in Britain here, be it the spectacular mountains, the ever-changing coastal weather painting dramatic colours everywhere, or the incredible diversity of wildlife, which, sadly, is rarely seen elsewhere in the UK. Little Loch Broom (it's not that little) is the sea loch we are situated upon and it is part of a wider MPA (marine protected area) for the unique life that resides within it. There are excellent boating opportunities on the loch on calmer days, and also opportunities for recreational fishing around the entire coast – just ask Chris the campsite attendant for some local, rugged Highlander knowledge. There is much to be made of the hill-walking (especially the foreboding yet beautiful An Teallach), fat-biking, trail running, hill-loch fishing with the small chance of ferox or arctic char (which we ask you to return as these are genetically distinct and isolated populations). It's also a very popular stop-off point for NC-500 travellers. Our price range is lower than that of any managed campsite we know of and you'll find an abundance of peace and quiet whilst you're here. From EarthMind Fellowship CIC: At various points in the year we can provide a variety of workshops for exploring nature, both inner and outer, incorporating herbal medicine and nutrition, health and wellness, stress-management, HeartMath, Wilderness Therapy and creative approaches such as dance, music, art and writing. If you would like to know more please contact Owen Okie at emf@earthmindfellowship.org. 20 grass pitches on a gently sloping field. 3 electrical hook-ups; 2 men's, 2 women's and 1 disabled loo, plus 2 unisex showers. Communal kitchen (including washing-up area and fridge) and a washing line. If not booked by a group, the bothy facilities can be used by campers: eating area, wood-burning stove, darts, board games, tourist info, small library and comfy settee. Campfires allowed; firepits provided on half of pitches. BBQs must be off grass. Owen runs nature-based retreats for mental and physical health and self-development (visit his Earthmind Fellowship website for further details). You can also rent the gas-lit cottage for a more luxurious stay. 20 grass pitches on a gently sloping field. 3 electric hook-ups. No hard-standing pitches. Tents, groups, dogs – yes. Caravans and campervans (max 3 at any one time; max length 6m) – yes. Caravans must be towed by four-wheel-drive vehicles. Either head to the bothy and cosy up by the peat fire to wait it out or head the 30 miles to Ullapool, where there’s a great local bookshop, a fine chippy and several decent pubs. Try the Ferry Boat Inn (01854 612366) by the lochside. The site is a great place for walking, climbing and kayaking – there is a colony of seals living just a quick paddle away, often dozing on the rocks or popping up for a peak. Corrieshalloch Gorge is a spectacular chasm that you can reach easily by road (20 minutes). There’s also An Teallach (8 miles away) – ‘Scotland’s finest ridge walk’ and including 2 Munros – the 635-metre Beinn Ghobhlach just behind the campsite, and a beautiful 5-mile loch-side stroll to the roadless off-grid community of Scoraig. Much further afield, Gairloch Marine Life Centre (40 miles; 01445 712636) sees visitors join an expert marine biologist on a 2-hour cruise to spot porpoises, whales, dolphins and basking sharks. The Dundonnell Hotel (01854 633204; nr Dundonnell; 7½ miles) has a restaurant and also does fine bar meals with frequent live music – choose either the Cocktail or the Broombeg Bar. If you’re prepared to head further afield, the Frigate Café (01854 612969) in Ullapool is a classy continental bistro that seems to have got lost and turned up in the far north-west of Scotland. It has a great little kids’ area and a backroom where you can hide from the weather with a hot chocolate. Take the A9 north from Inverness on to the A835 to Ullapool. Approximately 10 miles from Ullapool at Braemore Junction turn left on to the A832 for 10 miles then turn right on to the single-track Badrallach road for approximately 7 miles. The Westerbus (01445 712255) Gairloch–Inverness–Gairloch passes the road end (approx 7 miles from the site). There is no bus-stop sign, so please wait at the junction and make sure you can be seen. The bus toward Inverness passes the road end at 08:50 on a Monday, Wednesday and Saturday, and travels back from Inverness on the same days at 17:20 arriving at the road end just before 19:00. Please make sure you give yourself plenty of time to walk in either direction as the road to and from the campsite is not flat or straight and can be very exposed in places. Do not walk this path if you are not at a good level of physical fitness.